Australia and New Zealand Cruise February 24 – March 8 | Oosterdam Discover two fascinating countries on our most popular cruise of all time. Experience the best of New Zealand from the rolling hills of Napier to the stunning bay of Wellington, and onto the magical South Island. Our visit to Australia starts with a dazzling overnight in Melbourne followed by our breathtaking arrival into Sydney for Mardi Gras – the world’s largest gay celebration! With the currency exchange at a 7-year low, and falling airfares, it’s the perfect year to travel. And our fares start at just $1499 for 12 days of true sensory overload! Singapore to Hong Kong Cruise March 29 – April 9, 2015 | Celebrity Millennium Some cruises truly inspire, and our new Asia cruise blends an incomparable combination of exotic destinations, world-class entertainment, and incredible onboard events. It’s the perfect way to explore the best of spectacular Vietnam, indulge in an overnight in vibrant Bangkok, and relax on the stunning island of Koh Samui. All on the world-class 1800-guest deluxe Celebrity Millennium! Airfares are on sale starting as low as $850 round trip, and we have amazing rooms as low as $1599! There’s never been a better way to explore one of the world’s greatest destinations. 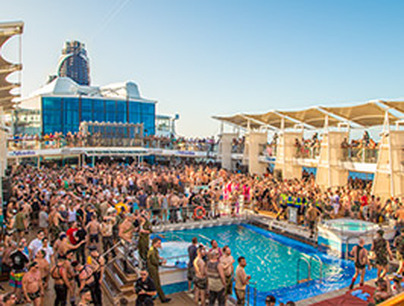 Europe’s Largest Gay Cruise August 14–24, 2015 | Celebrity Equinox Europe’s largest gay cruise takes a new course next summer on our favorite premium ship. We’ve created an amazing voyage from Rome to the best of Italy, Greece, and Turkey including overnights in both Mykonos and Istanbul, plus our first-ever visits to Bodrum and Crete. Get ready for eight amazing destinations in ten magical days, plus all the parties and entertainment you love! The only Atlantis cruise next summer is on sale now and selling faster than ever! The Biggest Party in the SouthFebruary 1–8, 2015 | Celebrity SilhouetteThere’s still time to join us on our famous Caribbean cruise this winter on Celebrity Silhouette. Atlantis’ biggest cruise of 2015 features non-stop gay and lesbian entertainment, massive outdoor parties under the sun and stars featuring four top DJs, and 2800 friends from around the globe basking in the Caribbean sunshine. We’re sailing from convenient Ft. Lauderdale to San Juan, St. Maarten and our favorite private island paradise of Labadee. A few great rooms are still available, but space is very limited. Article by Steven Skelley & Thomas Routzong. Information provided by Atlantis Events. Copyright 2014 Sunny Harbor Publishing.